December 7, 2015--Finished these "stars" into two ornaments. Love how they came out and they are quiet large--5.5" in diameter. One of these ornaments will be part of my ANG Delaware's Seashore Chapter's Holiday Lunch and Ornament Exchange which is taking place today. Hope the recipient likes it. Tried something a little different for my signature on the back's red velvet fabric. Just initials with the date (done on my Bernina sewing machine). Like how it came out. August 31, 2015--Completed all the stitching on the five arms and outlined the star with red Kreinik thread. I like how the Kreinik seems to hide irregularities in stitch compensation along the diagonal lines. The green basting thread will assist me in finishing the star as a round ornament. Instead of adding stitches to the star's background, I'll back the canvas with a shiny white fabric since the canvas itself has opalescent threads running through it (can't see it in the pictures). I'm very pleased at how well it came out. August 26, 2015--Moving along nicely--fourth arm completed. Stitching two of these ornaments at the same time, so it's taking time to do each section. The compensation stitches aren't easy to do along the diagonal lines of the star and I'm constantly aware of the chance to "over stitch" a pattern. The project photo (first picture below) shows this as a round ornament with no background stitching. I'm thinking of doing a light coverage darning pattern using a very shimmery thin thread in the background. Hmmm....will have to play with that idea. August 18, 2015--Third arm of the star is completed. Compensating the stitches along the angle of each arm is a challenge and I may have to outline each arm to cover up discrepancies and other irregularities (LOL). August 12, 2015--Second arm of this delightful ornament is stitched. Looking forward to seeing how the colors will look when the third arm is done. August 7, 2015--The basting and first arm of the star is stitched. There was lots of basting, but it was necessary to properly line up the inside and outside points of the star. Also makes a nice guide for compensating. Susan Jones, however, has written very detailed instructions on where to place the basting stitches and how to compensate the complicated stitches in each star arm, so very little has to be decided upon. Easy, peasy :-). 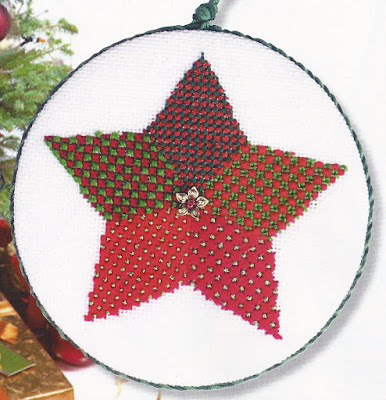 August 4, 2015--Started stitching Susan Jones Star Crossed ornament. This project is from the July/August issue of Needlepoint Now magazine and the challenge of variations and compensation stitches is right up my ally. Below is a project photo. In process pictures will be posted as each arm of the star is stitched.